The statue of former mayor Frank Rizzo stands in the Thomas Paine Plaza, Municipal Services Building across from Philadelphia city hall. There is now a movement to have the statue removed. 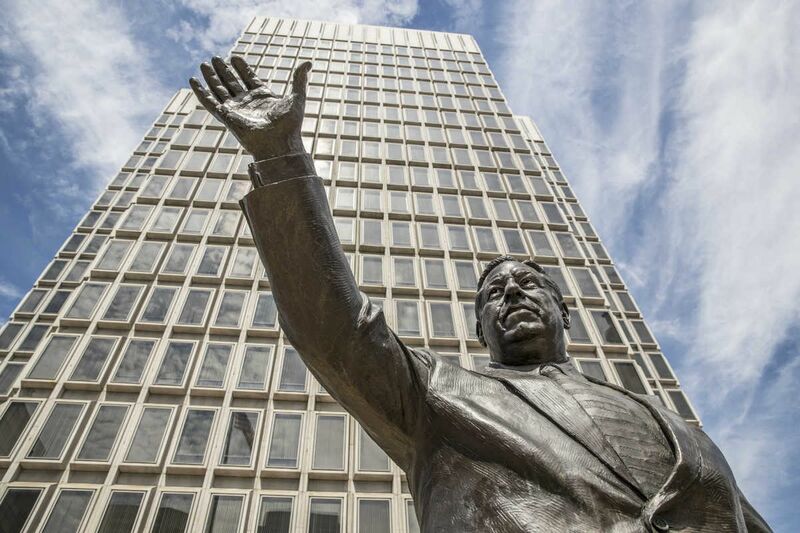 Because he oversaw and maintained police brutality in the black and brown communities in which I grew up, the statue of Frank Rizzo must immediately be removed from the steps of the taxpayer-funded Municipal Services Building. Not one more cent of my tax dollars maintaining it. Not one more moment of my property housing it. Not one more word from my city excusing it. The Frank Rizzo statue must be moved to private property, and it must be moved now. Frank Rizzo was both the symbol and the substance of a racist system upheld by law enforcement. His police force was used to maintain racial boundaries that kept blacks trapped in red-lined communities, locked into a segregated educational system, and mired in the ongoing morass of second-class citizenship. We've all heard the stories by now. But in an atmosphere where white supremacists denounce dissent as fake news, the truth is worth repeating. Under Rizzo's direction and approval, Philadelphia police officers stripped Black Panthers naked in the street. They beat black children who were demonstrating for black history classes. They broke nightsticks over a black man's head for running a stop sign. But those were just a few isolated incidents. In truth, Rizzo's police department engaged in cruelty so pervasive, that by 1979, the U.S. Justice Department had filed a lawsuit against them, saying their unfettered use of brutality "shocks the conscience." That's what I remember. The feeling of shock that overcame me when I realized that Rizzo's police weren't there to protect brown people in Philadelphia's poorest communities. The feeling that they could hurt us with impunity. The hopelessness of seeing the things they did. I was 13 or 14 years old when the truth of police brutality became a reality for me. My parents had divorced, we'd moved to North Philly from the more affluent Northwest section of the city, and things were hard. The neighborhood was different. The poverty was palpable. One day soon after we arrived, there was a commotion outside. I remember looking out the third-floor window of the house we shared with my mother, my uncle and my aunt. My brother, three years younger than myself, scooted up beside me, and we watched as two white police officers bent a black man over the hood of a white car. Within seconds, they were beating him mercilessly with nightsticks. The man screamed out repeatedly, "Get his badge number!" And as a crowd gathered around him, watching the beating play out amid the man's screams, the hood of that white car turned red with the black man's blood. No one, it seemed, recorded the officer's badge number. No one, it seemed, was surprised. In a neighborhood beset by poverty and isolated by disinvestment, Rizzo's police were not there to protect and serve. They were there to maintain systemic racism. They were to let black people know, in no uncertain terms, that they would not be treated equally. They were there to convince us that we were worthless. That's what I remember about Frank Rizzo. That he oversaw a system that frightened me as a child, and forced the people in my community to bond together as a people under siege. We shared from what little we had. We understood what mattered most. We lived within racial boundaries patrolled by Rizzo's police. It should surprise no one that a few years after that incident, the man who used violence to enforce Philadelphia's system of racial repression would tell Philadelphians to "vote white." Nor should we be surprised that the same Philadelphians who heeded that racist advice are now defending the memory of the man who so thoroughly abused the black community. Sadly, some of those people are black. That's not a surprise, either. After all, you can't enslave a people without winning support from within their ranks. That's what Rizzo did. He enslaved us mentally. Just as slaveholders used black overseers to heap abuses upon their fellow Africans, Rizzo used some blacks to maintain Philadelphia's systemic discrimination. With brute force, and with a few key promotions of black and brown people who would help him, Rizzo maintained Philadelphia's racial hierarchy. And those who would excuse Rizzo's racial animosity because he sprinkled crumbs to a few favored blacks have no sense of history. But if those who love Rizzo must celebrate him, I won't stop them from doing so in a privately funded museum. If, however, they insist upon doing so on property that is maintained with my tax dollars, I will fight them. For the black children who were beaten while demanding to learn black history, and the Black Panthers who were stripped naked on the streets of North Philly, and the man who was beaten while screaming for a badge number, I will fight. Rizzo's statue must be removed from publicly funded property. It's the least we can do for all the people he abused.